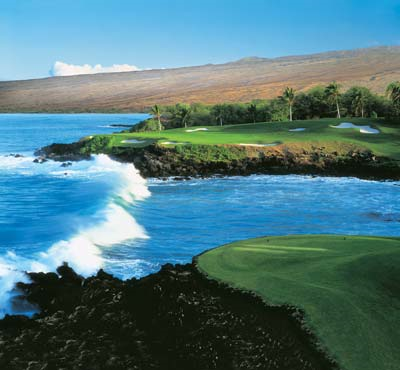 Since 1964, the Golf Course at Mauna Kea has led the way in standards of course beauty and design, solidifying its place in Hawaii's history as one of the most scenic and favored golf courses. Avid golfers and guests of the Mauna Kea Beach Hotel continue to enjoy Robert Trent Jones, Sr.'s award-winning golf course at our Big Island hotel and its recent updates and beautification by Rees Jones. 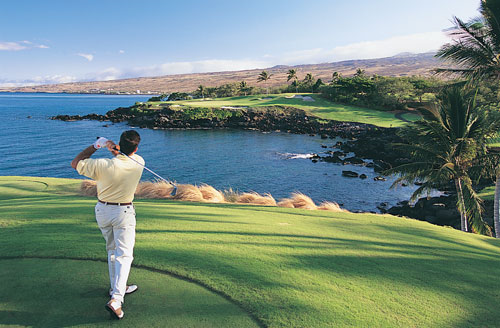 Guests of the Mauna Kea Beach Hotel can take advantage of the golf course's superior amenities including world-class practice facilities that feature a driving range, and putting green. Brush up on your technique with a private lesson or group clinic at the golf resort, and elevate your game while enjoying epic views of the Kohala Coast's rolling waves. 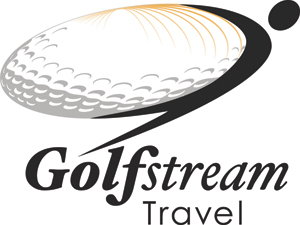 Golfers can also gather together at Number 3 Restaurant, and savor the clubhouse restaurant's tasty menu and refreshing beverages. 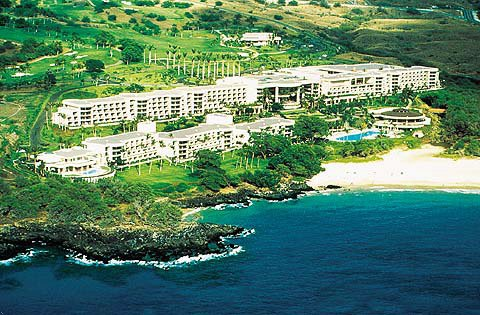 The Mauna Kea Beach Hotel is a luxury Hawaiian resort in a class by itself. 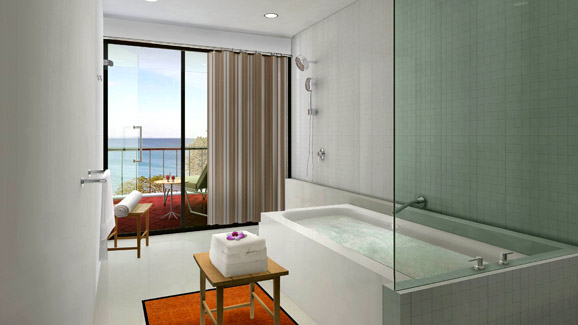 You'll marvel at the way John Hara Associates Inc. of Honolulu artfully melded three guestrooms into two in the main building, and created spacious new floor plans with vast, glamorous baths-where you can soak up the sunny ocean view or golf vista, right from the tub! All of our luxury lodging accommodations have beautiful new interiors by Barry Design Associates Inc. of Los Angeles with large flat screen TVs, media hubs, bedside iPod dock with clock radios, updated bedding, luxury L'Occitane amenities, elegant furnishings, solid doors and a few surprising touches you will love. 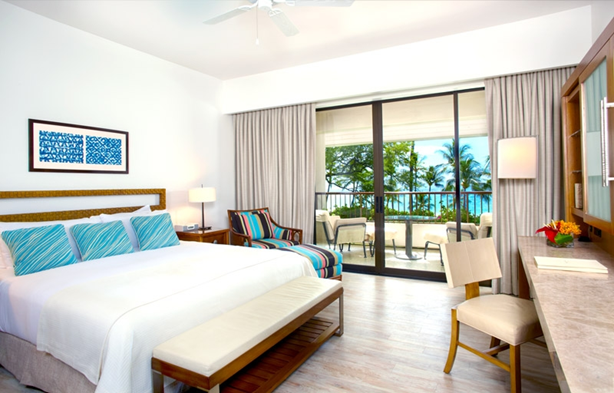 Guestrooms at our luxury resorts on Hawaii's Big Island have crisp, clean lines, cloud white and bold sunset colors, along with the unchanged wow of wonderful views from the wide lānai. New, refined furnishings and fun finishing touches are subtly supported by hi-tech bells and whistles to produce a luxury guestroom experience that is ultra-high quality and ultimately comfortable. Kauna’oa Bar for sunset cocktails, Hawaiian music, sushi, pool, darts and more. 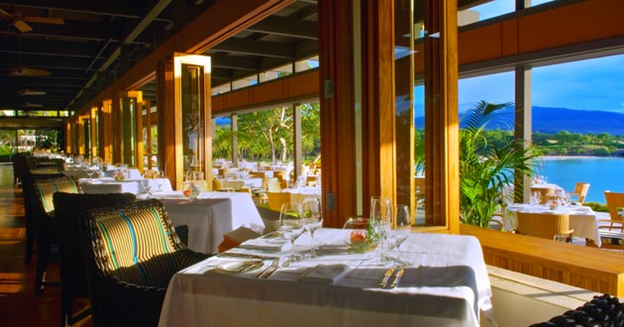 Mauna Kea Beach Hotel restaurants are designed with a creative combination of cultured international cuisine and fresh, local Kohala Coast ingredients prepared with "lokomaika‘i" (sharing with kindness from within). With a delicious mix of steadfast tradition and new attitude, our Big Island fine dining restaurants have exciting new sounds, sights, scents and tastes to share with you, whether you're barefoot on the beach or all dressed up with someplace wonderful to go. Dinner at Manta is an occasion every night, with a dynamic new exhibition kitchen to showcase our chefs' artistry and the next step in the evolution of oenology: the "Enomatic wine experience." An innovative way to serve 48 distinctive wines, selected from new trends, high-end and the latest stars from various vintners, the Enomatic is just one highlight of The Mauna Kea resort's new, extensive wine program, designed to surprise and delight again and again. And in the morning, Manta is the place for long, leisurely breakfasting and pleasant conversation over made-to-order waffles and omelets, fresh tropical fruits and juices, healthy whole grain cereals and various irresistibles from the pastry kitchen with a second, maybe third, cup of the Big Island, Hawaii's famous Hawaiian coffee. This is the Mauna Kea's breakfast buffet, with its ocean-overlook and birdsong symphony, and this is what your family will remember. Thirsty Golfers seeking a mid-round oasis, will love the tasteful new look and tasty menus of our golf clubhouse restaurant, "Number 3" - almost good enough to guarantee a lower score on the back nine. Enjoy a Grass-Fed Burger or Classic Crab Louis in a relaxed, casual atmosphere, along with a cold one from the tap, signature Mauna Kea cocktails or frosty fruit smoothie. A Hawaii vacation doesn't take a lunch break-it's part of the fun and many pleasures of the Mauna Kea experience. Enjoy time out of the sunshine at the cool, renewed Hau Tree restaurant right by the beach, with new chairs and tables, colorful umbrellas, refreshed kitchen and great new menu items, side by side with your favorite Hawaiian sandwiches, hamburgers, hot dogs, fries, salads and ice cream treats, including the "insider's" Ovaltine Froth. And if there's ever been a better barstool for watching the perfect Pacific sunset, we don't know where it is. The little round bar right off Kohala Coast's Kauna‘oa Beach is still just about the best spot anywhere for a smooth tropical cocktail and a view of the elusive green flash. Overlooking the bay of its namesake, Kauna’oa Bar & Grill proves a fun, comfortable and casual gathering place for guests and locals of all ages to enjoy. Soak in the picture perfect sunset on the patio with your favorite cocktail against a background medley of live Hawaiian music or challenge friends and family to a game of pool or darts in the game room. Six beers on tap, wines by the bottle or glass along with sake selections and a fully appointed bar complement the simple, tasty comfort foods perfectly executed using the freshest locally sourced ingredients. House specials join café and pub fare such as burgers, artisan pizzas and an authentic sushi bar! The combination of good food, drink, nightly entertainment and unparalleled views of the bay make Kauna'oa Bar & Grill the perfect destination for an unforgettable evening on the Kohala Coast. About Resort - "Every great beach deserves a great hotel." In the restaurants, exciting new sights, sounds, scents and sensational tastes elevate the experience of dining in our luxury Big Island, Hawaii hotel. The legendary Mauna Kea Golf Course, updated to current USGA standards of play, where Rees Jones sets a new benchmark for Big Island golf. Gracious hotel guestrooms, artfully enhanced by John Hara Associates Inc. and Barry Design Associates showcase Mr. Rockefeller's signature "understated elegance" in a graceful fusion of modern features and fabulous style.